Our hospital was a teaching hospital, which meant that I would spend an awkward amount of time chasing away young residents who would gather around my son’s incubator like small children around a small aquarium. They became so bold that as I would be reading the Bible to my son, they would request that I move out of their way so that they could circle around his incubator for their lesson of the day. I denied them the backstage access that they selfishly took. The lead doctor (who I affectionately nicknamed “short jerk”) attempted to override my guardianship and insert himself where I stood. He failed to take note that he was 5’6’’, while I was 6’5’’. When the alarms for my son were ignored, I became a visual alarm at the nurses station. Some nurses thought that what I was doing was awesome, while others felt that I was a nuisance. They would announce when I had entered the NICU, and everyone looked at me with smiles. I was the guy who stood up to the bullies on the floor. I became my son’s protector. I had become his father. On December 12 th at 10:00pm the doctor asked to speak with my wife and I. He told us that we had made it beyond the storm. 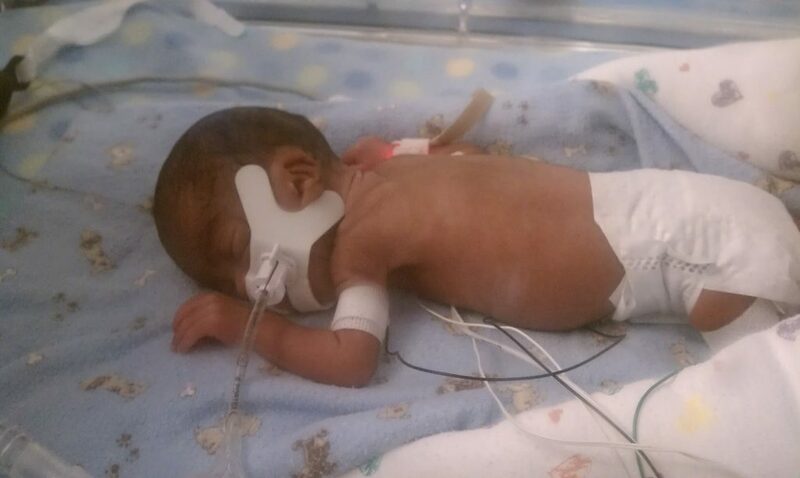 He assured us that we had advanced beyond the most difficult portion of our son’s NICU journey. It was time to discuss the plan for our son coming home. The doctor requested to have this detailed meeting that very next day on December 13th which we told him was excellent because that was our wedding anniversary. What better gift to receive on that day than the news of when your most cherished possession was coming home to be with you. At exactly 5:26AM that following morning my son went home—but not with his earthly father. I remember holding him in my arms praying, while the NICU staff cried. The doctor who had proudly marched his students into the NICU and invaded our space without remorse lost his cool. He began to quickly unravel emotionally and had to be escorted away. The impossible had just occurred: victory had turned into defeat faster than technology and innovation could respond, and no one had an answer. They allowed my wife and I to take our son into a private room to have our final moments which I thought was unique, but what happened next was even more unique. As we handed our son over to one nurse another nurse immediately approached us to eagerly request that we fill out exiting paperwork to sign out of the NICU. My wife was in shock and she immediately began to walk out while the nurse began to chase us down with paperwork. I stopped the nurse and assured her that once I took my wife home that I would return later that morning to do whatever paperwork was needed. The nurse’s response was, “But the paperwork needs to be filled out by both parents. We have to do paperwork. It has to be done.” “If you want to hit me, you can. Go ahead and let out all of your anger. You don’t deserve this.” I could have agreed to that invitation. We were already in a hospital so they wouldn’t have far to travel. But I chose not to lay a finger on them. They both breathed a sigh of relief when I told them that I would have to decline their offer. When asked why I chose not to become violent like others would have, I told them that in that moment, I began living for my son. Whether I was holding his hand or holding his memory I was living for him by living through loss. I would take this journey with him on my shoulders while struggling with the weight of pain on my back. Everyday he is my motivation, and he is a passion that allows me to continue to prevail when it feels as though there is no oxygen to inhale. I do it for him. I do it for me. I do it, because that’s what NICU Fathers do.